Researchers using CT scans and 3-D printing have created accurate, custom-designed prosthetic replacements for damaged parts of the middle ear, according to a study being presented today at the annual meeting of the Radiological Society of North America (RSNA). The technique has the potential to improve a surgical procedure that often fails because of incorrectly sized prosthetic implants, researchers said. Hearing works partly through the transmission of vibrations from the eardrum to the cochlea, the sensory organ of hearing, via three tiny bones in the middle ear known as ossicles. 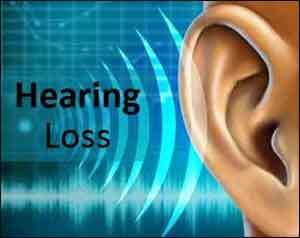 Ossicular conductive hearing loss occurs when the ossicles are damaged, such as from trauma or infection. Conductive hearing loss can be treated through surgical reconstruction using prostheses made from stainless steel struts and ceramic cups. The surgery, which generally involves tailoring a prosthesis for each patient in the operating room, is plagued by high failure rates. Dr. Hirsch and colleagues studied 3-D printing as a way to create customized prostheses for patients with conductive hearing loss. The technology has been used successfully to solve a number of other medical prosthesis problems, including in the areas of joint replacement and facial reconstruction surgery. The researchers removed the middle linking bone in the ossicular chain from three human cadavers and imaged the structures with CT. They employed an inexpensive 3-D printer to create prostheses to restore continuity for each of the middle ears. The prostheses were made from a resin that hardens when exposed to ultraviolet laser light. Each of the prostheses had unique measurements. Four surgeons then performed insertion of each prosthesis into each middle ear, blinded to the bone from and for which each was designed. The researchers then asked the surgeons to match each prosthesis to its correct source. All four surgeons were able to correctly match the prosthesis model to its intended temporal bone — the bone containing the middle and inner parts of the ear. The chances of this occurring randomly are 1 in 1,296, according to Dr. Hirsch. The results suggest that commercially available CT scanners can detect significant anatomic differences in normal human middle ear ossicles and that these differences can be accurately represented with current 3-D printing technology. More significantly, surgeons are able to detect these differences, which should not only increase the likelihood of a proper fit, but also decrease surgical time, according to Dr. Hirsch. The next step in the research, Dr. Hirsch said, is to create prostheses out of biocompatible materials. The researchers are also looking at a different approach that would combine the 3-D-printed prostheses with stem cells.